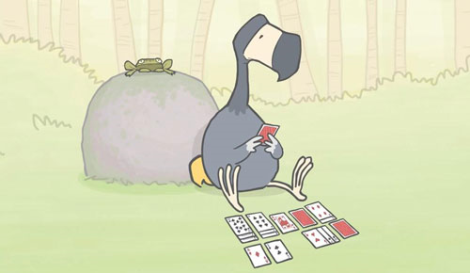 Aardman, the creators of hit animated films including “Wallace and Gromit: Curse of the Were Rabbit” and “Flushed Away” have partnered with the Durrell Wildlife Conservation Trust to create a cute and witty PSA about critically endangered species starring the last dodo. Even though the sweet cautionary tale won’t prepare you for the coming second age of the dodos, it’s an interesting look at animals that are on the brink of extinction, such as the Hispaniolan solendon and the mountain chicken frog. I don’t know about you, but I rooted for this lonesome dodo to find a friend! The Durrell Wildlife Conservation Trust has been working diligently since 1963 to protect vulnerable animals around the world. Some of their most influential projects were vital influences for aiding the rebounding population of the echo parakeet, Rodrigues fruit bat and the Mauritius kestrel. Dodos were native to the small island nation of Mauritius, where they were driven to extinction in 1693 due to over hunting. These three foot tall flightless birds had no fear of humans and were easy prey for settlers and sailors visiting the island. It is also estimated that introduced animals to the isle of Mauritius attacked dodos and their eggs, including cats, pigs, rats, monkeys and dogs. Deer vs. Man: Who Will Claim Victory? -- Crazy Animal Video of the Day!